Amazed, and as if astonished and stupefied, I stood still. 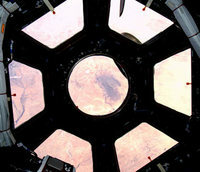 The ISS has a Living Room WIndow! Note there will be a nice pass of the ISS and the Jules Verne spacecraft tomorrow (Wednesday night).See:http://tinyurl.com/3akj65The AT (aka Jules Verne) will precede the station by a couple minutes.